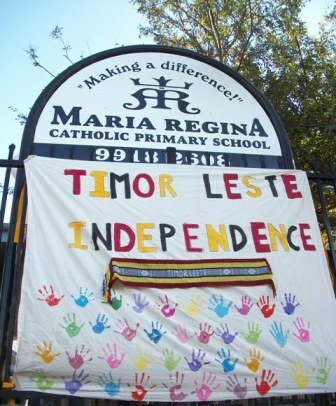 Today Sunday, 20th of May, is the 10th Anniversary of Timor-Leste’s Independence. On Friday the 18th of May, as part of its annual celebrations of its Friendship with the village of Soibada, Maria Regina School, Avalon, held its annual celebration of this day by dressing the whole school and themselves in Timor-Leste’s colours, by reciting prayers and giving presentations to raise the awareness of guests of why they sought friendship agreement with the children in the village of Soibada, and by raising funds to ensure basic needs, such as food, pencils and schoolbooks, can be met. 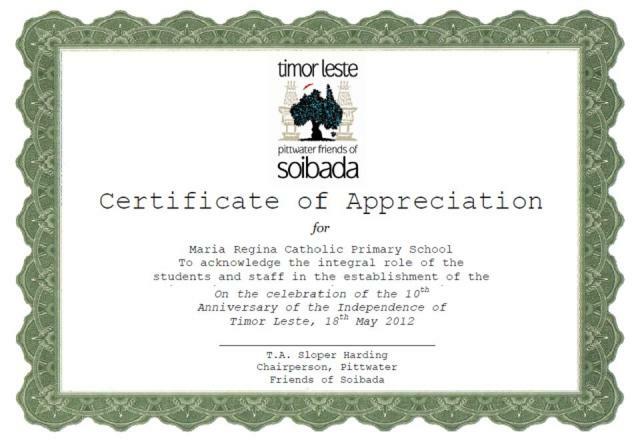 Part of this Celebration is a special assembly to open the day, activities in each class to increase an educational awareness of Timor-Leste(such as learning songs in Tetun), the children consuming the same food their friends in Soibada would for the day and bringing or purchasing crafts made by locals and people from Soibada; funds that will go back into the Pittwater Friends of Soibada’s ongoing projects to self-empower this village. A very special guest was Consul Fonseca Dos Santos Pereira, from the Consulate-General of the Democratic Republic of Timor-Leste in Sydney. At the request of the Prime Minister, the Governor-General, Ms Quentin Bryce AC CVO, and Mr Michael Bryce AM AE are visiting Timor-Leste this weekend (Saturday May 19 and Sunday May 20). They will represent Australia at the inauguration of the new President, Taur Matan Ruak on Saturday 19th of May, and attend a Flag-raising ceremony in recognition of the 10th anniversary of Independence and Presidential Inauguration, Presidential Palace, to mark the 10th anniversary of the country’s independence.